Photographing a wedding in Logan Utah, in November - you NEVER know what you're going to get weather wise. Sometimes you'll have a beautiful day where it's 70 degrees. When we shot Mike and Dorine's formal session, we had "perfect" weather. A nice sunny, not too hot evening. There wasn't a cloud in the sky, which can make things a little slower for photographing to avoid harsh shadows, but it was still a perfect day. The wedding day a week later - boy was it cold! The wedding wasn't taking place outside, but Mike & Dorine were married in the Logan Utah LDS Temple. Once they're married, they come outside to greet their family and friends. It was raining. Windy. Cold. Even a little bit of hail. Their family all huddled under any shelter they could find while waiting for the newly married couple to come out the side door. Most actually waited inside hoping to keep out of the cold. Fast forward to the moment they came out of the temple. The family and friends of the newly married couple waited, a little shivery, outside and cheered them on as they walked out. Usually the greeting time lasts 10 or 15 minutes. This time the crowd cheered, then I think they all ran to their cars. The beauty of this moment came when the couple walked out, and stood in the rain, with their fedoras and kissed. They were so in the moment. Everyone huddled together and although excited for the couple, couldn't wait for the greeting party to end. 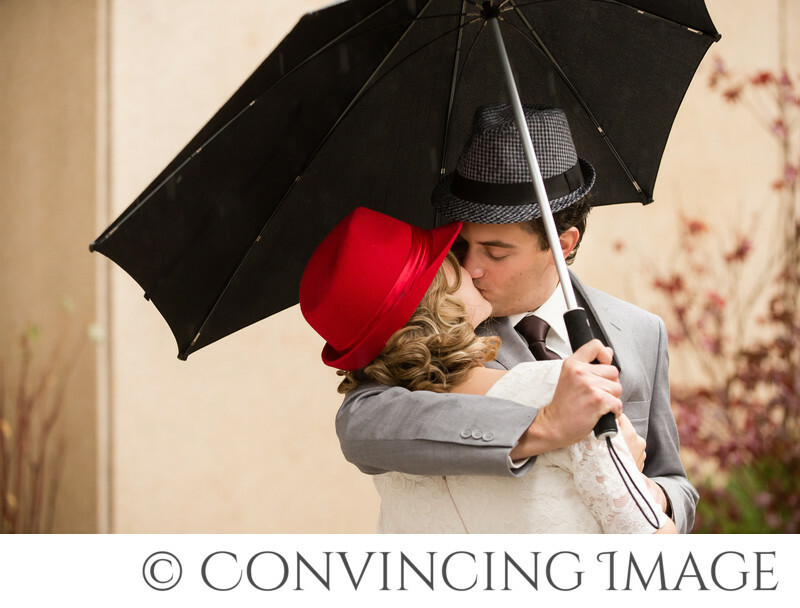 Mike and Dorine stood in the rain, and kissed and hugged and let the crowd disperse while they enjoyed their time together on their wedding day. I'm not sure they even really realized the crowd was there. The cold didn't matter (Dorine didn't even have a jacket!) The rain was no big deal. So in love! Staring into each other's eyes. Beyond happy that they get to be together forever. 1/250; f/3.5; ISO 1600; 105.0 mm.